This is theAdbusters Culture Jammers Buy Nothing Day video from seven years ago; they report that not one teevee station would carry it, including MTV. Until we challenge the entrenched values of capitalism – that the economy must always keep growing, that consumer wants must always be satisfied, that immediate gratification is imperative – we’re not going able to fix the gigantic psycho-financial-eco crisis of our times. The journey toward a sane sustainable future begins with a single step. It could all start with a personal challenge, such as this: make a vow to yourself to participate in Buy Nothing Day this year. Follow #WalmartStrikers Tweets here. You can watch some live streaming of various events here, as well as you can also discover if there’s a protest near you, and stand with them in solidarity. Raw Story is also frequently updating their live stream strike videos. It really is quite exciting to see the verve on display.The United Food and Commercial Workers show you how you can help support fired Walmart Strikers. I’ll paste in some tweets from their page; it’s a beautiful thing to witness and to support. This is another fantastic step in the class wars, Western mega-consumerism, and a foil to capitalism itself. 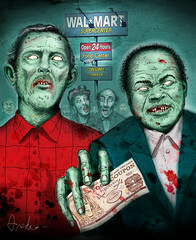 Oh, and Ralph Nader is asking if the Left and Right can unite against Walmart. I wasn’t initially fond of his framing, but he’s talking about the financial costs of wage-slavery to the budget. If that were a consideration to our Ruling Elite, there wouldn’t be this wealth disparity, a permanent underclass, nor relentless slashes to the social safety net, imo. But he makes his case ably. Again, follow the Walmart Strikers here. Updated: Anthony Freda just sent me his take on Black Friday; coupon is from the Department of Bread and Circuses; in Beyonce We Trust. Ouch. This entry was posted in occupy movement, social unrest/nonviolent revolution, trade unions. ILWU. Bookmark the permalink. Small business Saturday, shop local for the holidaze. Making and giving all through the year saves me the stress of thinking I need to do it all on two, ‘special days.’ Trying to use as little as needed (thinking sustainability here) the biggest gift an of us can give. Thanks for the coverage of the labor actions. It is a great gift, nonquixote. I’ve long favored giving as the spirit moves, as well. well, except for the grandkids, i guess. they’ll all get one nice useful gift for them to share. o, and you’re so welcome! i’m giddy as a school girl over all this. damn. wonder how many cities by now? they’d hope for 1500, but that’s hard to imagine, isn’t it? but the list so far is stunning.